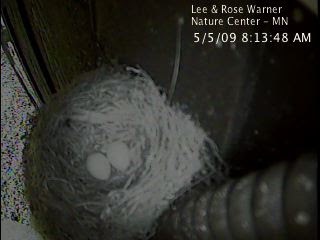 Following the typical pattern, the Eastern Phoebe laid a second egg this morning. Last year the first eggs was laid on June 16th with incubation starting on June 20th. Last year was a second nesting. Some years the birds use the same nest twice. You can view last year's highlights online. I think the most interesting things we seen data-wise from the nest cam project is that every year the birds have laid 5 eggs but only had four birds fledge. This seems pretty typical. Also, the length of incubation and time to fledge can vary. In 2007, incubation took 16 days but in 2008 it only took 14 days. This is flip-flopped with the time to fledge. In 2007 it took only 17 days to fledge but in 2008 it took 19. That's a two day difference for each value so in both years the combined incubation+time to fledge was 33 days. Interesting coincidence? Could there be a connection wherein a shorter incubation means a longer time till fledge? We'll know more when we can look at this year's data as well. The 19 days to feldge seen last year is longer than the typical range of 15-16 days listed in The Birders's Handbook.